If you do your own yardwork and landscaping, you know the hassle of trimming bushes and trees. Ornamentals such as Holly leaves are sharp to the touch, and excessive raking renders the user with calluses and blisters. Finally, the clippings fall into flower beds or walkways requiring a lot of labor to remove. There is a great solution to avoid these hassles that come from trimming bushes and trees. Yes, I mean without incurring the cost of hiring a landscaper! Purchase a heavy duty tarp from your hardware or home improvement store. The tarp is going to work in the same way that a painter uses a drop cloth. In areas where you have mulch or flower beds below your bushes and trees gently cover them with the tarp. Feed the tarp all the way to the trunk of the bushes you intend to trim. Be careful not to damage the flowers under the tarp by crushing them. 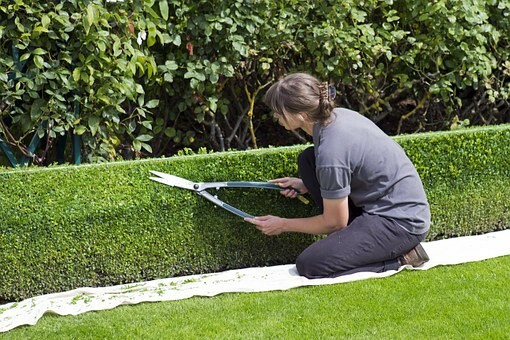 Once the tarp is in place, proceed to trim your bushes allowing the tarp to catch the trimmings. Once you have completed the trimming, pull the tarp out (works best with two people.) The bushes are trimmed, and there is no clean up needed. Saving the best advantage for last grab all four corners of the tarp and drag the trimmings to your curb, compost pile, or burn barrel with ease.